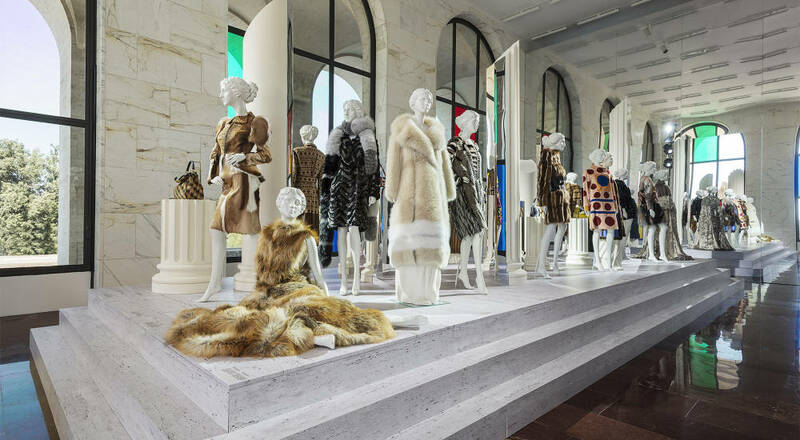 Paris, 2016-Aug-26 — /EPR Retail News/ — In conjunction with Fendi’s 90th anniversary, the Italian house is celebrating nine decades of passion, creativity and savoir-faire with an exhibition entitled “FENDI Roma – The Artisans of Dreams”. The Palazzo della Civiltà Italiana provides a stunning venue for the event. Fendi is celebrating its 90th anniversary in grand style, including a breathtaking fashion show against the magical backdrop of the Trevi Fountain. The Italian house has also conceived a captivating exhibition, “FENDI Roma – The Artisans of Dreams”, at the Palazzo della Civiltà Italiana, Fendi’s new headquarters. The exhibition celebrates the unique craftsmanship and creativity that have informed Fendi’s DNA since its beginnings. The installations illustrate the dual perspective and complementary fit between heritage and innovation, values that define the artisanal craftsmanship that Fendi has meticulously perpetuated. A poetic and sensual tour takes visitors into nine worlds that reveal Fendi’s heritage and history in Rome. Video, tactile interaction and audio combine for a multi-sensory experience, replete with optical illusions for a total immersion into the universe of the Italian house. Visitors discover the Obsession installation, a psychedelic furry jungle inhabited by over three hundred furry little Bag Bugs imagined by Silvia Venturini Fendi, a third generation member of the Fendi family and creative director for Fendi Accessories, Menswear and Childrenswear. TheCraftsmanship part of the exhibition features an entirely different ambiance where a stimulating visual and graphic atmosphere presents the work of artisans, including live demonstrations. There is also an exhibition of drawings and sketches by Karl Lagerfeld, creative director of Fendi since 1965. A host of other surprises await visitors at this memorable exhibition, which is open until October 29, 2016. Open Monday to Saturday, 10 am to 8 pm until October 29, 2016. This entry was posted in Apparel, Business, Fashion, Marketing, PR, Retail, Retail Design, Retailer and tagged 90th anniversary, “FENDI Roma – The Artisans of Dreams”, celebrates, exhibition, Fendi. Bookmark the permalink.